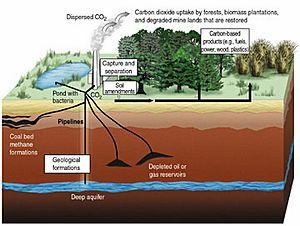 Carbon sequestration is the process of capturing carbon dioxide (CO2) gas in the atmosphere. It is also the process of capturing CO2 from from new and existing power plants and factories before they are released into the atmosphere. Once the CO2 gas has been contained it is placed into long-term storage. Carbon sequestration aims to eliminate harmful human introduced carbon from our atmosphere by disrupting the carbon cycle. It is also to prevent catastrophic climate changes in this and the next century. Terrestrial Sequestration- plants and trees store CO2 in their bodies and in their roots. geologic sequestration- bury the CO2 thousands of feet underground. An oceanic phytoplankton bloom in the South Atlantic Ocean, off the coast of Argentina. Encouraging such blooms with iron fertilization could lock up carbon on the seabed. Carbon sequestration Facts for Kids. Kiddle Encyclopedia.